For quality and affordable fire extinguisher services that meet or exceed California's Code of Regulations - Title 8, Section 6151 call AAA Fire Protection Services at (800) 543-5556. 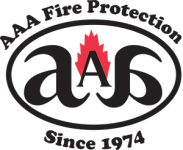 We are an expert in fire extinguisher services in fire suppression technology and serve businesses in Los Gatos and throughout the South Bay Area. We bring integrity and honesty to each of our clients and our services are high-grade and affordable. The California Code of Regulations - Title 8, Section 6151 is very exact in what it demands of businesses in terms of fire extinguisher expectations. As a company who has worked with the California fire code for more than 40 years, we make it easy for businesses just like yours to become compliant and to maintain compliance. In addition to fire extinguisher services, we offer a complete fire extinguisher sales department so you can find the exact type of fire extinguisher that your business needs in the proper size too. For more information about working with our company, please give us a call at (800) 543-5556.